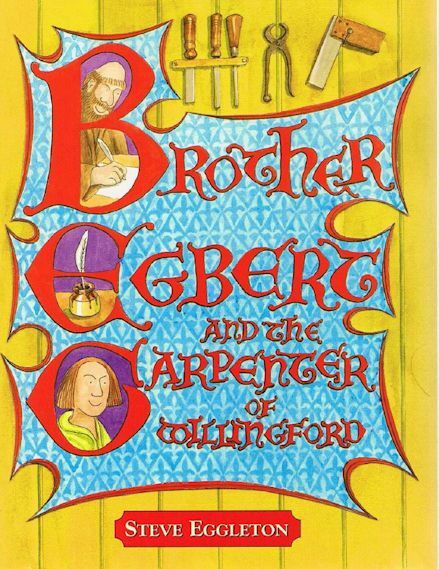 Brother Egbert is a medieval monk who spends most of his time in the scriptorium copying out pages from the Bible. In his spare time he writes his own stories gleaned from passing travellers and local gossips. 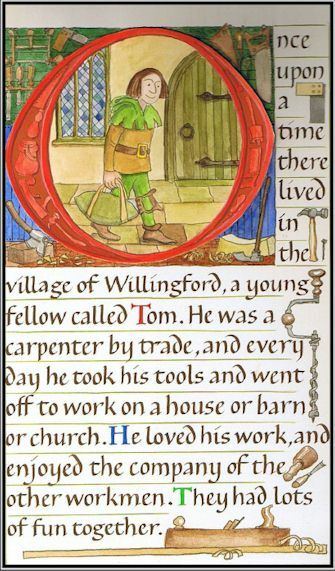 The first story tells of Tom, The Carpenter of Willingford, who is tricked into setting out on a journey to the Eastern Kingdom to play and sing at the Royal Court. En route he has to perform for his supper and so gains in skill and confidence. Arriving in the Eastern Kingdom he is saddened to find a wasteland where all the trees have been removed and the land has become dry and dusty and barren. Tom eventually gets to play for the King who is cheered by his music and touched by his simple rural wisdom. He is despatched to find tree seeds for the land and a herbal remedy for the King’s ailing daughter. The book is beautifully written and illustrated by Steve Eggleton, with calligraphy by Cathy Stables. It is aimed at children up to 10years of age but will appeal to older children and adults alike. 64pp, in full colour throughout. Copyright © Erskine Press Limited. 2000 - 2016. All rights reserved.